AC/DC current sensors capable of highly accurate measurement starting in DC range. The AC/DC current sensors allow you to take measurements of large DC and AC currents. The current output mode makes it possible to connect the AC/DC current sensors to the direct current input terminals of the WT Series Power Analyzers and PX8000 Precision Power Scope for measurements. With a single power meter, you can measure very small currents by direct input and large currents of up to 2000 A using the current sensor (and of up to 1400 A using the 751552 clamp probe). The AC/DC current sensors can be used for large current and power measurements in a wide range of application areas, such as hybrid electric and pure electric vehicles, batteries, inverter motors, energy, railway, and industrial motors. *1: Use an insulated conductor or cable for wiring on the primary side. 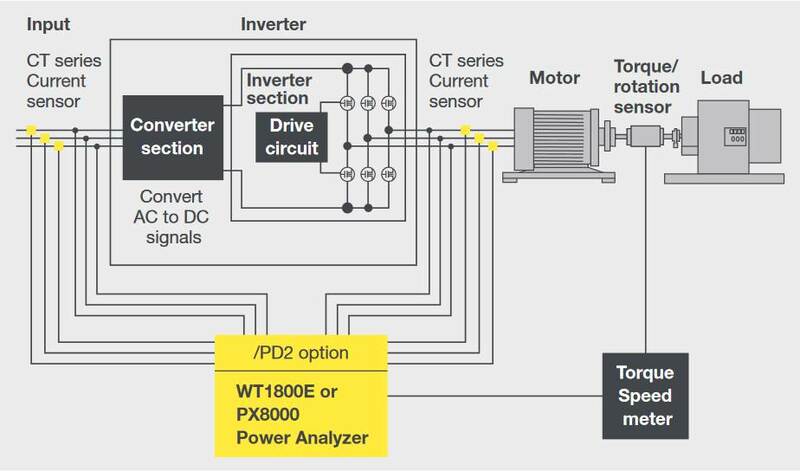 *2: When connected to CT2000A current sensors, use DC power supply option (/PD2) for WT1800E or PX8000. When connecting the current sensor, CT2000A, to the DC power supply option (/PD2) terminals on a WT1800E or PX8000 Power Analyzer, make sure that the output current does not exceed the range shown below. * Use conductors or cables with reinforced insulation for primary input. * Make sure that the total load resistance including measuring instrument’s internal resistance and external load resistance (Rb) is within the specification to prevent oscillation. And confirm the rated power specification of the load resistance.